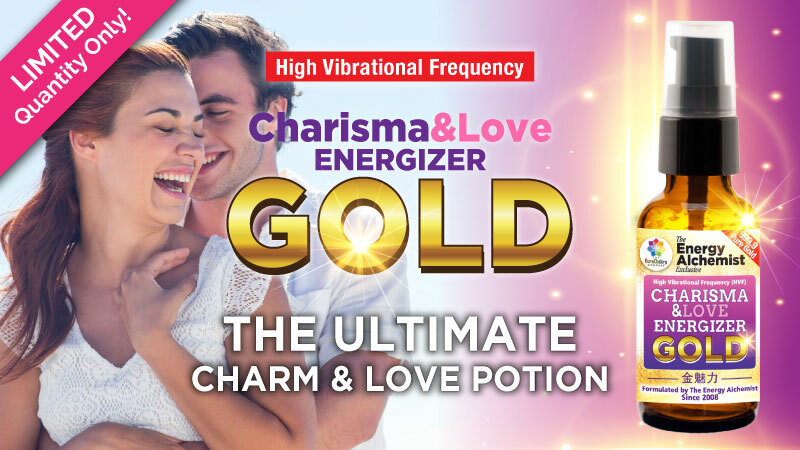 Our Best-Selling High Vibrational Frequency(HVF) Energizers are an exclusive alchemical formula created by The Energy Alchemist with the purest & finest essential oils powered with crystal energies & power affirmations. New! Now Enhanced & Improved In Performance With Quantum Waves Technology! 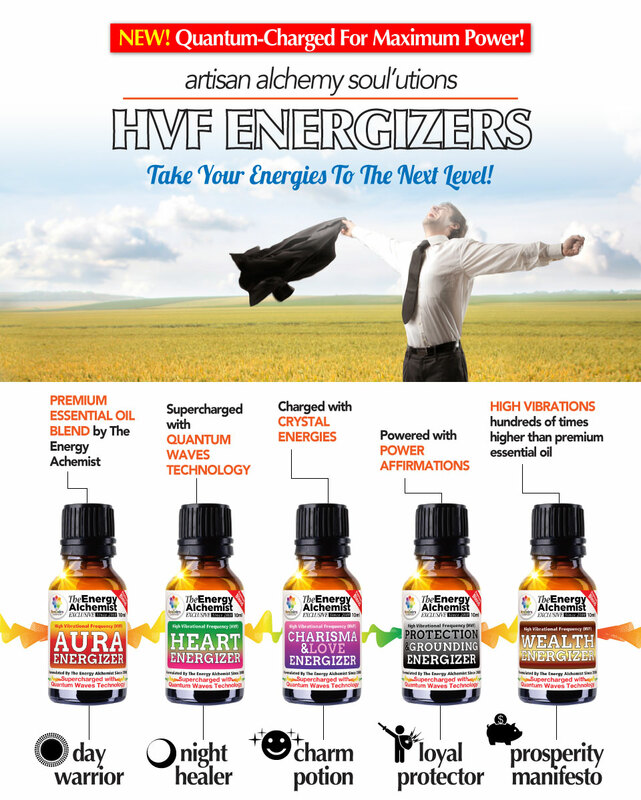 The vibrational frequencies of our HVF Energizers are proven by Scientists to be hundreds of times higher than the normal pure essential oils. 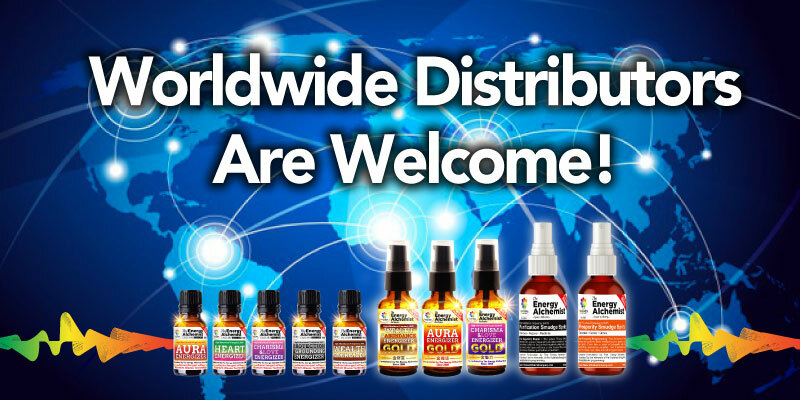 Our High Vibrational Frequency (HVF) Energizers are formulated with only- The purest, exclusively selected premium quality essential oils sourced from all over the world. 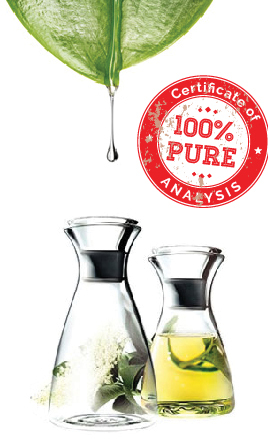 Only the best quality oils can produce high vibrations and positive energies. 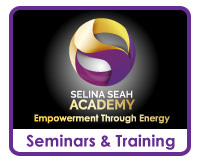 Most people do not realize that they have a 'second skin'-an energy skin that protects and shields their energy system just as physical skin protects their inner organs. 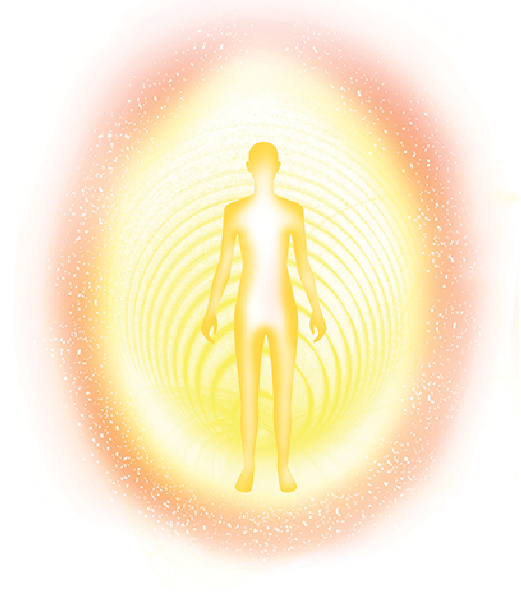 Like physical skin, the aura is permeated with natural disease-fighting chemistry, and it hosts the sensory communications of the nervous system. 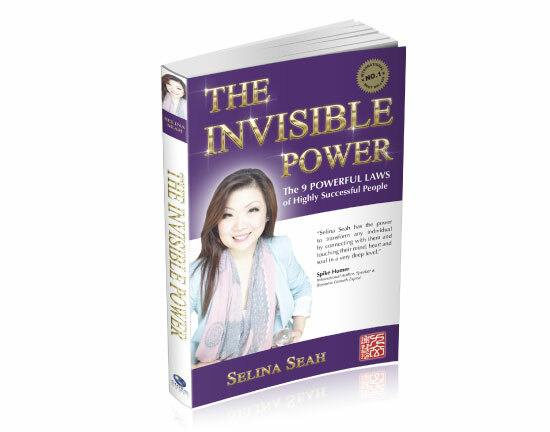 This second skin is the boundary between your personal energy system and the energy of your environment. This energy skin is your aura. Every living being has an aura. Your aura, when its strong acts as a protective shield. When fragile or damaged it can leave you drained, unwell and feeling disconnected from yourself. Achieve more Greatness in life! 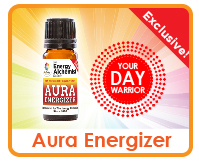 Day Warrior & Night Healer for your daily abundance! For Your Daily Dose of Positivity & Supercharged Energies! 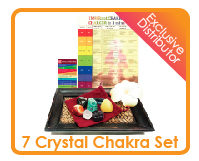 Charged and Programmed with Healing Crystals and Affirmations for optimum cleansing, protection and healing. 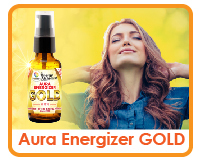 The Aura Energizer is a powerful yet gentle blend helps to raise your vibration and energize your aura. 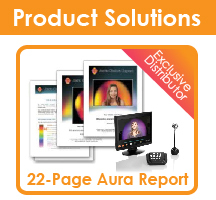 You may also download the E-Brochure + Instructions of Aura Energizer here! 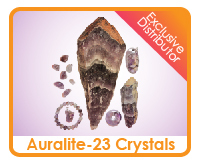 Charged and Programmed with Healing Crystals and Affirmations for optimum protection, healing and abundance. 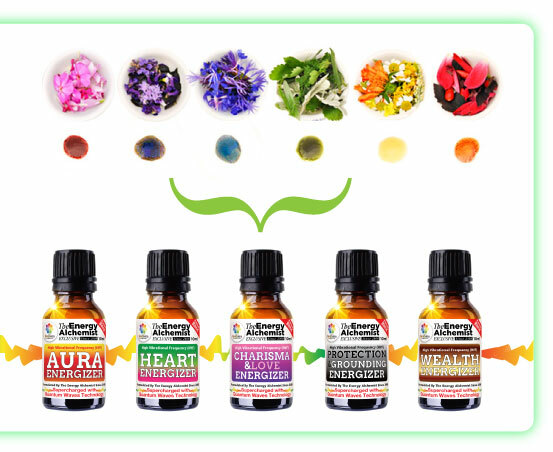 Packed with healing properties, this precious blend unblocks and heals any emotional blockages, soothing the soul. 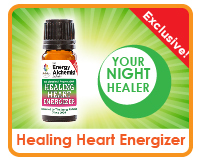 You may also download the E-Brochure + Instructions of Heart Energizer here! 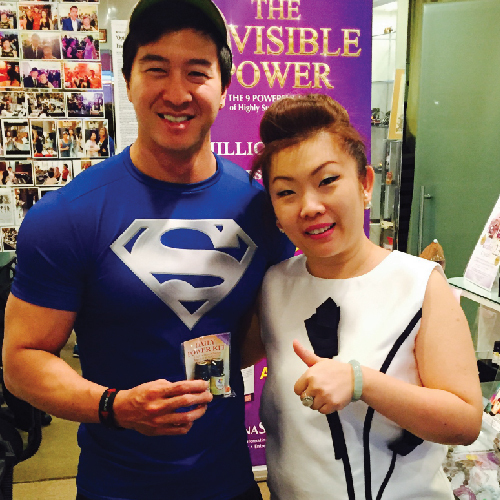 Supercharge your Wealth, Charisma & Protection! 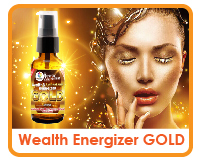 A Rich blend specially formulated to create high vibrations of wealth and abundance. Energize, influence and impact your aura with this rich scent to attract and manifest your abundance today. 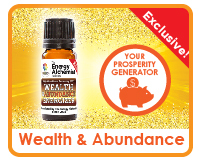 You may also download the E-Brochure + Instructions of Wealth Energizer here! Indulge in this alluring concoction created to boost attraction and enhance relationships. 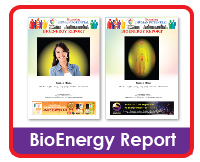 The vibrations of the oil works well in increasing self confidence, popularity and charisma. A beautiful and sensual aroma to enjoy anytime. 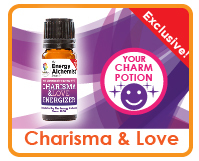 You may also download the E-Brochure + Instructions of Charisma & Love Energizer here! 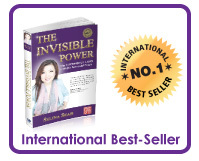 A powerful formula to dispel negativity, fear & anxiety. This oil also works to block psychic attacks, shielding you from various forms of negativity to bring back a sense of security, peace & confidence. 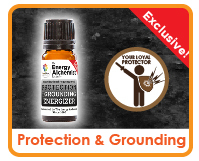 You may also download the E-Brochure + Instructions of Protection & Grounding Energizer here! HVF Gold Series are now available! 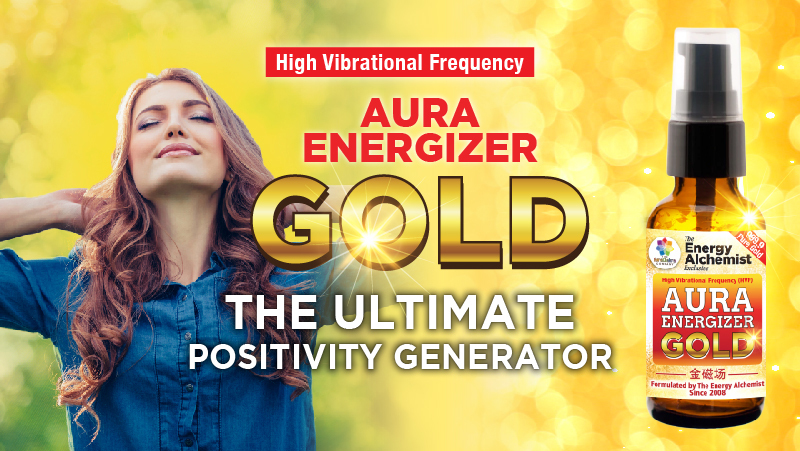 You may also download the E-Brochure + Instructions of Aura Energizer Gold here! 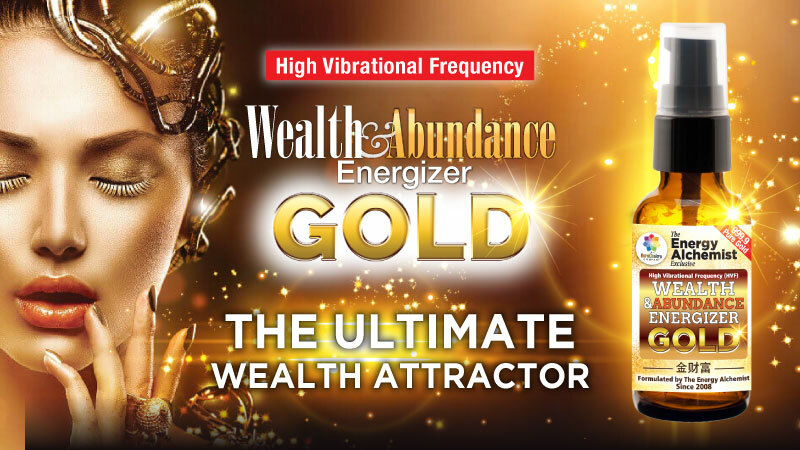 You may also download the E-Brochure + Instructions of Wealth & Abundance Energizer Gold here! 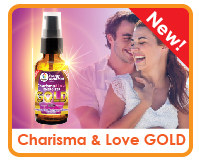 You may also download the E-Brochure + Instructions of Charisma & Love Energizer Gold here! "I always have them in my pocket. 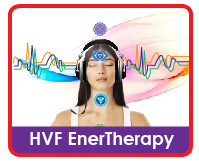 You feel purified and protected and free of negative influences… Gives you that extra advantage you need to get into that next level… The HVF Energizers have pumped-up my energy level and changed my life…"
"I always have fear and anxiety especially in the morning at the office. 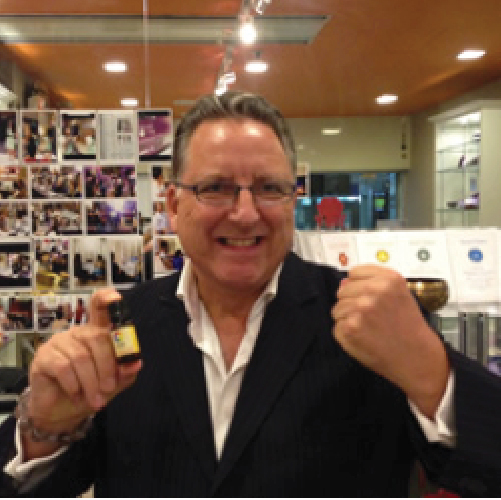 But after my experience with your Protection oil, the feeling was phenomenal!. It calm me down immediately and I feel confident or should I say protected when I'm at work. Great stuff!" "The most amazing next big thing is this. 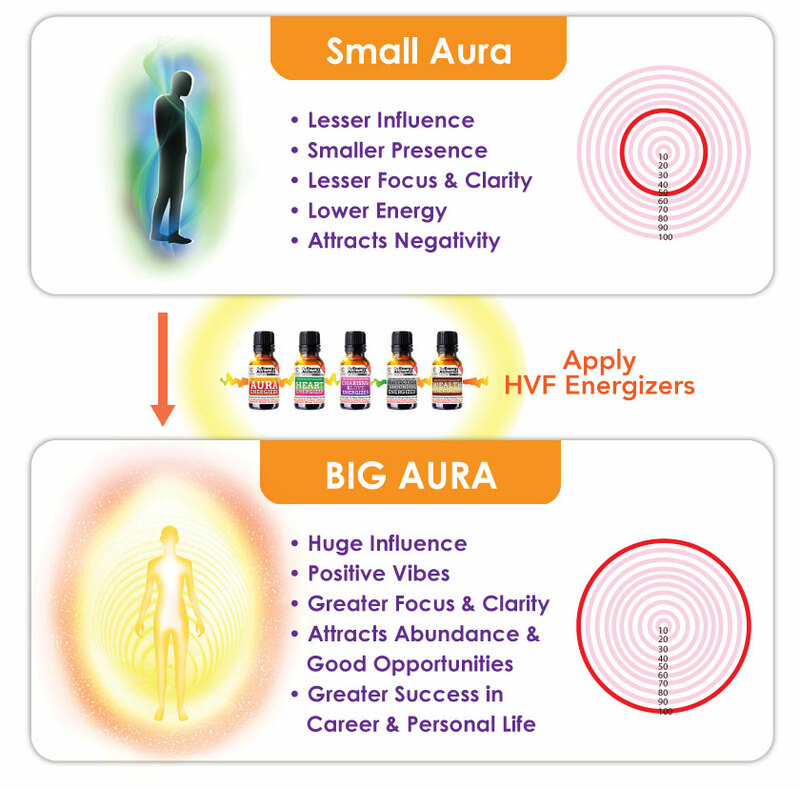 I had bought HVF Energizers and when I did a second reading 1 month later, I was blown away by the huge improvement of my energy & my Aura Size. 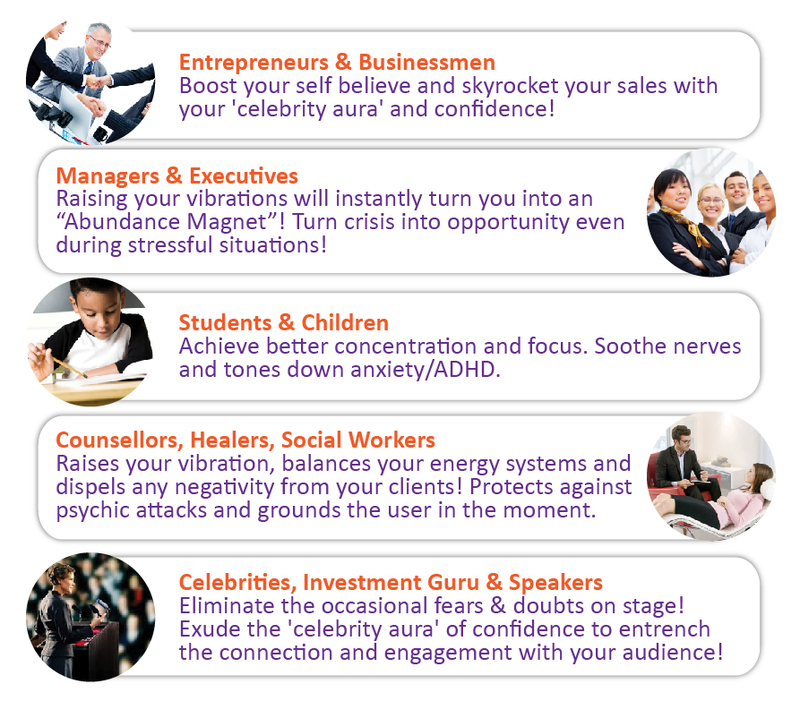 The HVFs are a ‘must buy item’ for anyone who wants to work on their energies and improve their lives!" 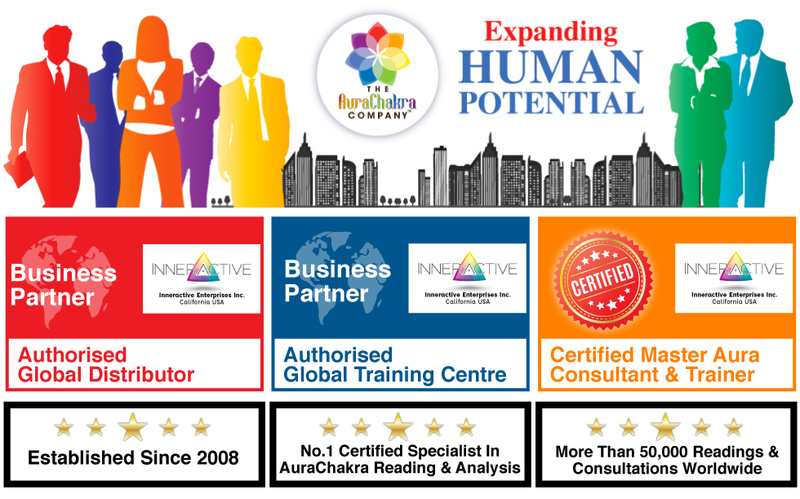 It is such a blessing when I came to know about the Aura Energizer! 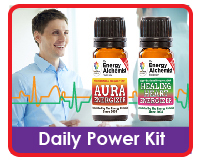 It’s an oil that has high vibration that lifted my energy and throughout the day, I will make sure to have it with me! Copyright © 2019, The AuraChakra Company. All rights reserved.